For the baseball pitcher, see Jeremy Hill (baseball). Jeremy Hill (born October 20, 1992) is an American football running back for the Cincinnati Bengals of the National Football League (NFL). He was drafted by the Bengals in the second round of the 2014 NFL Draft. He played college football at Louisiana State University (LSU). A native of Baton Rouge, Louisiana, Hill attended Redemptorist High School, where he was a three-sport athlete in football, baseball, and track. In football, Hill was an All-American running back. He was a teammate of future LSU offensive lineman La'el Collins. He finished his senior season in 2010 with 302 carries for 2,260 yards and 36 touchdowns. Regarded as a four-star recruit (out of five) by Rivals.com, Hill was listed as the No. 21 running back prospect in his class. Hill attended Louisiana State University from 2011 to 2013. As a sophomore in 2013, Hill was a first-team All-Southeastern Conference (SEC) selection. He was also named the most valuable player (MVP) of the 2014 Outback Bowl after rushing for a career-high 216 yards and two touchdowns vs. Iowa. Hill was drafted in the second round with the 55th pick by the Bengals in the 2014 NFL Draft. On September 7, 2014, Hill made his debut rushing for 19 yards on 4 carries against the Baltimore Ravens. On September 14, 2014, Hill scored his first touchdown of his career against the Atlanta Falcons. On October 5, 2014, Hill caught 3 passes for a season-high 68 yards against the New England Patriots. On November 2, 2014, Hill rushed for a season-high 154 yards and two touchdowns in his first start in the Bengals' win against the Jacksonville Jaguars. Hill had a 60-yard touchdown run. On November 16, 2014, Hill ran for 152 yards on a season-high 27 carries against the New Orleans Saints, his second 100-yard game. Hill had a run for 62 yards in that game. On November 23, 2014, Hill ran for 87 yards on 18 carries and a touchdown against the Houston Texans, his fourth touchdown of the season. On December 14, 2014, Hill ran for 148 yards on 25 carries and 2 touchdowns against the Cleveland Browns, his second two-touchdown game, and third 100-yard game. On December 22, 2014, In the Bengals upset win over the Denver Broncos, Hill rushed for 147 yards on 22 carries and a touchdown, including a career-long 85-yard touchdown run in the first quarter. This was Hill's 4th game of the season with over 140 rushing yards. On December 28, 2014, Hill ran for 100 yards on 23 carries against the Pittsburgh Steelers, his fifth 100-yard performance and third straight. On January 4, 2015, Hill scored the Bengals' lone touchdown in a 26–10 loss to the Indianapolis Colts in the first round of the playoffs. Hill finished his rookie campaign with 1,124 rushing yards and 9 rushing touchdowns. He became the first Bengals' rookie to top 1,000 yards rushing since Corey Dillon in 1997. Hill's 1,124 rushing yards was the most among rookies and 8th most overall in the NFL. His 5.1 yards per carry average ranked him second among NFL running backs, behind Justin Forsett. He also recorded 27 receptions and 215 receiving yards on the season. On September 13, 2015, Hill ran for 63 yards on 19 carries and a pair of touchdowns in the Bengals' 33–13 win in the season-opener against the Oakland Raiders. The Bengals won at Oakland for the first time in franchise history, dating back from the first regular season game meetup in 1968. On September 20, 2015, Hill fumbled twice in the Bengals' 24–19 win over the San Diego Chargers and was benched. His replacement, Giovani Bernard, rushed for a team-high 123 yards in Hill's absence. 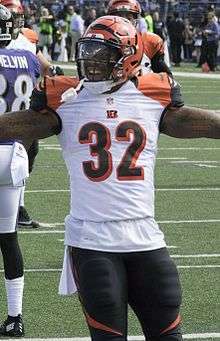 On October 4, 2015, Hill ran for a career-high three touchdowns in the Bengals' 36–21 victory over the Kansas City Chiefs, his second two-plus touchdown game of the season. On October 18, 2015, Hill caught his first touchdown reception of his career against the Buffalo Bills, a 13-yard run in from the line of scrimmage. On November 22, 2015, Hill ran for two touchdowns against the Arizona Cardinals, his third two-touchdown game. On November 29, 2015, Hill ran for 86 yards on 16 carries against the St. Louis Rams. On December 6, 2015, Hill ran for a season-high 98 yards on 22 carries and a touchdown in the Bengals' 37–3 victory over the Cleveland Browns, his eighth touchdown of the season. On January 9, 2016, Hill ran for 50 yards on 12 carries and a touchdown in the Bengals' playoff game against the Pittsburgh Steelers. The touchdown made it a 15–7 Steelers score in the fourth quarter. After the Bengals took a 16–15 lead with less than two minutes remaining in the game and got the ball back on a Vontaze Burfict interception, Hill fumbled the ball on the first play of Cincinnati's ensuing drive and the Steelers recovered. Pittsburgh went down the field and kicked the go-ahead field goal to win the game 18–16. Hill finished the 2015 season with 794 yards on 223 rushes for an average of 3.6 yards per carry. He finished the season tied with Devonta Freeman of the Falcons for most rushing touchdowns in the NFL. On September 11, 2016, Hill ran for 31 yards on 9 carries and a touchdown against the New York Jets, his first touchdown of the season. On September 25, 2016, Hill ran for 97 yards on 17 carries and two touchdowns against the Denver Broncos, his 7th career two-touchdown performance. Hill ran for a 50 yard gain in that game. On September 29, 2016, Hill ran for 71 yards on 21 carries against the Miami Dolphins. On October 23, 2016, Hill ran for a career-high 168 yards on 9 carries and a touchdown against the Cleveland Browns. Hill ran for a 74-yard touchdown and a separate run for 40 yards in that game. On October 30, 2016, Hill ran for 76 yards on 20 carries and a touchdown against the Washington Redskins, his fifth touchdown of the season. In January 2012, Hill pleaded guilty to carnal knowledge of a juvenile stemming from a January 2011 arrest and charge of oral sexual battery. In April 2013, Hill was arrested and charged with assault after being involved in a bar fight and was filmed assaulting an unidentified 20-year-old. In September 2013, he pleaded guilty to simple battery. ↑ Hanzus, Dan (2014-05-09). "Jeremy Hill drafted 55th by Cincinnati Bengals". NFL.com. Retrieved 2016-10-31. ↑ "Cincinnati Bengals running back Jeremy Hill 1-yard touchdown run". Retrieved 2016-10-31. ↑ "Cincinnati Bengals at New England Patriots - October 5th, 2014". Pro-Football-Reference.com. Retrieved 2016-10-31. ↑ Hanzus, Dan (2014-11-02). "Bengals stay atop AFC North with win over Jaguars". NFL.com. Retrieved 2016-10-31. ↑ "Wk 9 Can't-Miss Play: Hill has the moves". NFL.com. Retrieved 2016-10-31. ↑ Hobson, Geoff (2014-11-16). "Look who is back in first". Retrieved 2016-10-31. ↑ Marcum, Jason (2014-11-16). "Video: Jeremy Hill busts off 62-yard run vs Saints". Cincy Jungle. Retrieved 2016-10-31. ↑ Hobson, Geoff (2014-11-23). "Bengals big defense shuts down Texans". Retrieved 2016-10-31. ↑ Kirkendall, Josh. "Jeremy Hill leads the Bengals offense". Cincy Jungle. Retrieved 2016-10-31. ↑ "Jeremy Hill and Bengals run past Broncos". ESPN. December 23, 2014. Cincinnati's Jeremy Hill ran for 147 yards, the most by any player against Denver this season. He became the fourth Bengals rookie to rush for 1,000 yards and the first since Corey Dillon in 1997. ↑ Kirkendall, Josh (2014-12-29). "Bengals crushed by turnovers and Hill just misses". Cincy Jungle. Retrieved 2016-10-31. ↑ Hobson, Geoff (2015-01-04). "Colts banish Bengals". Retrieved 2016-10-31. ↑ Criswell, Josh (2015-07-13). "Rookie recap: Cincinnati Bengals RB Jeremy Hill". Death Valley Voice. Retrieved 2016-10-31. ↑ Kirkendall, Josh (2015-09-13). "Bengals crush Raiders, 33-13". Cincy Jungle. Retrieved 2016-10-31. ↑ "Bengals vs. Raiders All-Time Results". Retrieved 2016-10-31. 1 2 Marcum, Jason (2015-09-20). "Gio Bernard takes over as Jeremy Hill gets benched". Cincy Jungle. Retrieved 2016-10-31. ↑ "Jeremy Hill silences fantasy football critics, powers Bengals to victory". ESPN.com. Retrieved 2016-10-31. ↑ Harvey, Coley (2015-11-23). "Andy Dalton up, secondary and O-line down in Bengals loss". ESPN.com. Retrieved 2016-10-31. ↑ "Bengals' Jeremy Hill: Exits game with ankle injury". CBSSports.com. 2015-11-29. Retrieved 2016-10-31. ↑ Cosenza, Anthony (2015-12-06). "Don't look now, but Jeremy Hill is heating up". Cincy Jungle. Retrieved 2016-10-31. ↑ "Steelers Ryan Shazier forces Bengals Jeremy Hill fumble". NFL.com. Retrieved 2016-10-31. ↑ "Watch: Steelers win on FG after crazy finish". SI.com. 2016-01-10. Retrieved 2016-10-31. ↑ Toback, Rebecca (2016-09-12). "Jeremy Hill shaking hands instead of busting moves". Cincy Jungle. Retrieved 2016-10-31. ↑ Chisenhall, Jeremy (2016-09-25). "Jeremy Hill bounces back in loss to Broncos". Cincy Jungle. Retrieved 2016-10-31. ↑ "Bengals' Jeremy Hill: Paces rushing attack in Week 4 victory". CBSSports.com. 2016-09-30. Retrieved 2016-10-31. ↑ Marcum, Jason (2016-10-24). "Hill finally has massive game we've all been waiting for". Cincy Jungle. Retrieved 2016-10-31. ↑ "Bengals' Jeremy Hill: Touchdown Sunday in tie with Redskins". CBSSports.com. 2016-10-30. Retrieved 2016-10-31. ↑ Auzenne, Josh. "Jeremy Hill pleads guilty to lesser charge, gets probation". Retrieved 2016-10-31. ↑ "Suspended LSU RB Jeremy Hill pleads guilty to simple battery". Retrieved 2016-10-31.